The 'Frog and Snail' project was a body of work produced for French musical artists The Lovers, Fred de Fred and Marion Benoist. The characters of the Frog and Snail were introduced on the first album (also titled 'The Lovers'), and represented the alter-egos of the musical partnership. 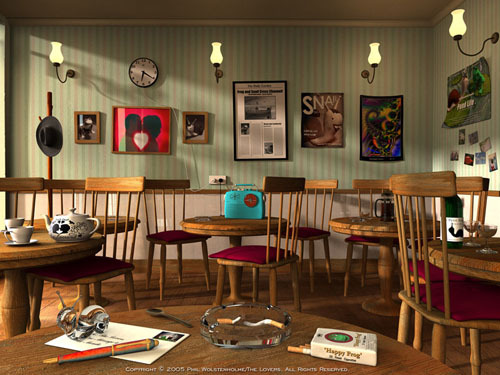 The 3D modelling and rendering was produced with 3D Studio MAX and Brazil r/s. Go to the Lovers Gallery. Frog and Snail characters are Registered Copyright © 2005 Phil Wolstenholme. All Rights Reserved.